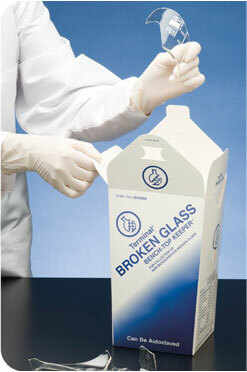 Broken glass is a danger to rubber gloves, skin, ongoing tests and anyone in the lab. Safely collecting and storing non-biohazardous broken glass is critically important. What is our real solution to this real problem? The Whitney Medical Solutions' Broken Glass Bench-Top Keeper. Decrease the risk of injury from non-biohazardous broken glass and other sharp objects by segregating them from other waste, safely collecting them in the Broken Glass Bench-Top Keeper. For convenience, this container is designed to be used right at your work station. It is prominently marked with broken glass symbols for identification. When the container is full, securely close it using the interlocking tabs on the lid and dispose of according to your facilities instructions. Made of sturdy, plastic-lined paperboard the Broken Glass Bench-Top Keeper contains moderate amounts of liquid. These handy containers ship and store flat, saving valuable storage space and fold together easily for use. The Whitney Broken Glass Keeper also comes in a Floor Model version designed for broken glass disposal in central collection areas.